In the year 1979 the Helicopter Services Organization was formed by the amalgamation of Iranian Helicopter Aviation Company (IHAC) and Helicopter Aviation Services Organization (HASO). 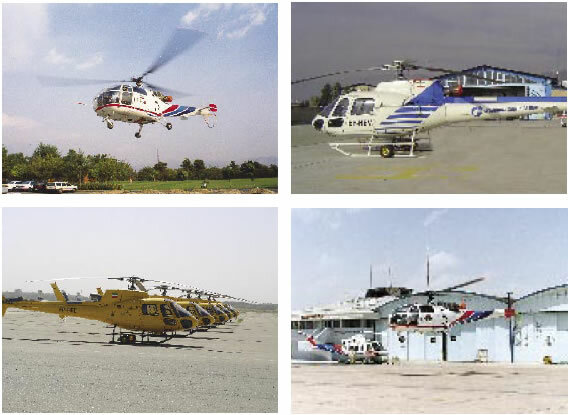 In the year 2004 the Helicopter Services Organization (HSO) changed its name to Iranian Helicopter Company (IHC) and became one of the affiliated companies of the National Iranian Oil Company (NIOC). This company provides aerial services to applicants in accordance with the I.R.I. Civil Aviation Organization and the International Civil Aviation Organization (ICAO) standards. 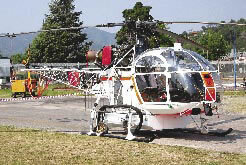 It owns about 35 helicopters of different types, such as Lama, Alouette III, Ecureuil B2 and B3, Puma, and Bell 212 and 205. As a main carrier, it is the largest (non-military) helicopter service provider in the country and the Middle East, with the least rate of accidents on the world scale. The main task of the company is to back-up and safe-guard Iran's large strategic oil, gas and petrochemical industries and provide the same services for the foreign oil and gas operating companies, such as, Total, Shell, Agip, Hydro Zagross, Edison Gas, B.G.P., C.G.G. and Terras Persia. To fulfill its obligations to its customers, it complements its helicopter fleet by cooperating with some reputable companies like Canadian Helicopters International (CHI), Heli Union (HU) and Gulf Helicopter Company (GHC). 2000 from two international companies namely IMQ and IQNET. 1. Flight support in exploration, drilling and production of oil and gas on land and offshore. 2. Sensitive and risky flights in seismic operations, and carrying external (sling) loads. 3. Ferrying injured and accident affected persons (MEDEVAC) and rescuing people in natural occurrences of earthquakes, floods, etc. 4. Flight operations for filming, expeditions, aerial excursions, forestry, fishing, pipelines, natural environment protection, etc. 5. Survey flights for mines exploration. 6. Flight operations related to power line transmissions, communications, radio, television and microwave towers. 7. Iranian Helicopters Company owns operational and repair stations throughout Iran in such places as in Shiraz (Main Base), Tehran, Karaj, Esfahan, Ahwaz, Gachsaran, Kish, Lavan, Bushehr, Assaluyeh and many temporary stations in other project areas.